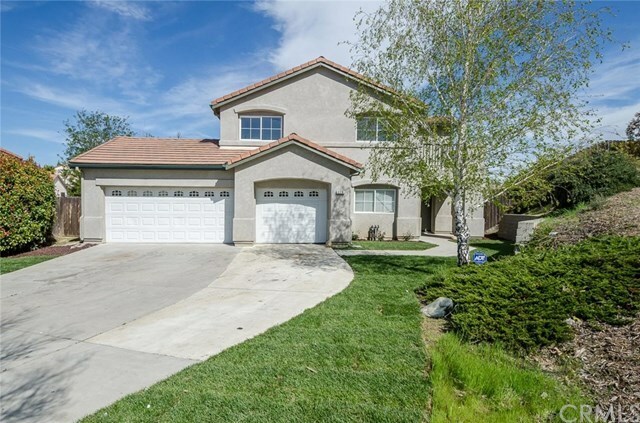 Gorgeous home located in the lovely neighborhood of Sunset Ridge within miles of the beautiful Paso Robles Wine Country. Situated on an expansive 21,000+ sqft lot this home is truly one of a kind. Featuring an updated kitchen with freshly painted cabinetry, granite counter tops, stainless steel appliances and high end oil-rubbed bronze faucet and hardware. Throughout the home you will notice and sleek new durable and easy care laminate flooring, beautiful tile in the bathrooms, and new plush carpeting in the bedrooms. Enjoy a fresh design inspired paint scheme with updated statement light fixtures and door hardware. Enter the beautiful master suite through double doors. Boasting a large walk in closet, his and her sinks, walk-in shower and separate soak-in tub. The large open floor plan of the home is perfect for entertaining with a built in bar area and conveniently located powder room. The front exterior shows amazingly with all new gorgeous landscaping and its spacious 3 car garage! The luxurious interior and exterior features truly make this home stand out from the rest.